EVENT: Pet-and-family-friendly dog walk and pet fest held in conjunction with the Dog Days of Summer. 100% of proceeds go to Save-A-Pet, a no-kill adoption center located in Grayslake, IL. COURSE: 3k (1.8 mile) course starting and ending in Cook Park. The course is through residential Libertyville, IL. Preregistration includes an event t-shirt, pet bandana, and goodie bag. Virtual Walkers will be mailed these items. Participants can choose between a dog or cat goodie bag the day of the event and through virtual registration. Registrants present at the event will receive 1 coupon for 3 free raffle tickets with any raffle ticket purchase. On-line registration closes at midnight on Friday, July 10th. Registration is also available at the adoption center and Save-A-Pet’s Dog Days of Summer booth on July 11th and 12th. Day of registration will begin at 8 am on July 12th. Goodie bags, bandanas, and t-shirts for participants will be offered to participants registering after the 10th. while supplies last. Click here to register now! PACKET PICK-UP: Packets can be picked up between 8:00 am and 10:00 am in Cook Park on the day of the walk. Same day registration will also be available at that time. Goodie bags and event t-shirts will be provided to those participants while supplies last. FUNDRAISING: Help raise funds for Save-A-Pet individually or grab some friends and create a team. Awards will be given to the three highest individual and three highest team fundraisers. TIPS FOR FUNDRAISING: Don’t forget to ask everyone you meet to support the Petathlon. Ask them for $10 or $20. Small amounts can make a difference! Ask not only your co-workers, family, and friends, but your hair dresser or barber, your mail carrier, your kids’ teachers, your clients, your baker, your favorite store owners, and others you interact with regularly. Sharing your page on Facebook and Twitter can increase your donations as well and spread the word about this great event! PET INFO: All dogs must be up to date on rabies and distemper vaccinations. Pet water stations will be available along the walk. Save-A-Pet reserves the right to dismiss any dog showing signs of aggression. ATTIRE: Be sure to wear comfortable shoes and clothing along with sunglasses and a hat or other sun protection. You may want to bring rain gear too. This is a rain or shine event! DOG DAYS OF SUMMER EVENT: Save-A-Pet will be at the Dog Days of Summer event from 9 am to 5 pm on Saturday July 11th and Sunday July 12th. If you can’t make the Petathlon, be sure to stop by and see us over the weekend. We will have adoptable pets, dog and family activities, and raffles. There are lots of activities happening at the Dog Days of Summer all weekend. For more information, please click here. TELL YOUR FRIENDS: Please go to Facebook and join the Petathlon event page. This will let your friends know you support Save-A-Pet and also are participating in a fun event! Click here to visit this event on Facebook. Please don’t forget to “Like” our Facebook page. VOLUNTEER: Save-A-Pet is always looking for new volunteers to help out in a variety of areas. Our volunteers help 365 days a year to care for the animals and raise funds to fulfill our no-kill mission. Click here to find out more about volunteer opportunities. 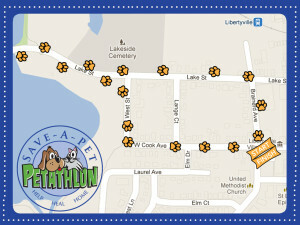 Please note that in order to volunteer at the Petathlon, you must first become a trained Save-A-Pet volunteer.